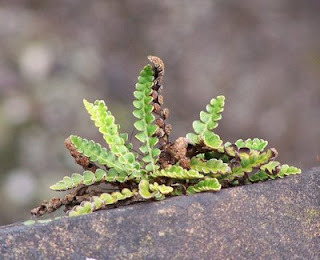 Banstead Botany Blog: Asplenium anyone? Chalk downland in the south-east of England is probably not the first place that you would go looking for ferns in the UK especially if you were searching for the smaller species of the Asplenium genus. However there is one place on Banstead Downs where a veritable cornucopia (its all relative) of such plants grow although it must be said they do not lend themselves to close inspection. Banstead Downs is split by the Epsom Downs railway line and halfway across the Downs is a brick bridge known as the Sheep Bridge. Walking across it and you would only notice the odd piece of graffiti and pass on. 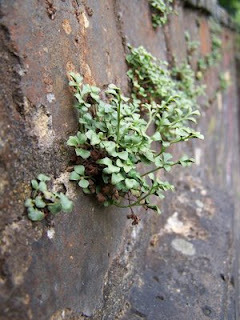 Look over the parapet and you might be surprised to see that the mortar of the brickwork supports a considerable level of plant life ranging in size from birch seedlings through Silene species to a number of small ferns including at least five species of Asplenium. In fern terms, walls in the south-east might be expected to be home to Wall Rue (A.ruta-maria, top left) which is very common and Black Spleenwort (A.nigrum) that in my experience seems to have a special affinity for railway bridges but in addition to these, both Maidenhair Spleenwort (A.trichomanes, middle) and Rustyback (A.ceterach or Ceterach officinarum, bottom left) are present. Now I realise that those of you who live in the west and north of the British Isles are thinking along the lines; "so what, the latter two occur on every wall and rock crevice available here". Well, here in the SE the situation is slightly different, A.trichomanes is much less common than in the more rain-endowed areas of the country and as for A.ceterach , a quick look at the NBN Gateway distibution map shows it has a marked southerly/westerly distibution in the British Isles and is absent from many 10km tetrads in the SE and even in those where it does occur it is by no means common . One interesting point is that there are many more plants on the hotter south-facing outer wall of the bridge than on the north-facing side. Virtually nothing grow on the inside walls. 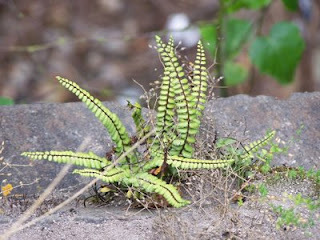 That's four Asplenium species, the fifth doesn't quite fit the "small" description, there are a few plants of Hart's-tongue fern (A.scolopendrium or Phyllitis scolopendrium). In addition there are a few other ferns that are out of reach that I have never identified. Worth having a look but remember don't lean over the parapet too far!!! Certainly no shortage of Maidenhair spleewort over here in Co Clare. Just been reading through your interesting earlier blogs. Will return again.